The Everhot 60 is the smallest of the Everhot Cookers. At 60cm wide it is a perfect fit for kitchens with a little less space and still offers two large ovens, an integral grill, cast iron hot plates & simmer plates. 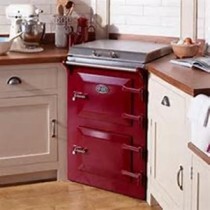 Cooker Dimensions: Width 598mm, Depth 600mm (including front handrail 680mm), Height 970mm (1530mm lid open). Cooking Area: Hot plate - W225, D355mm | Simmer plate - W175, D355mm | Top oven - W395, H290, D490mm | Bottom oven - W395, H290, D470mm. Ordering an Everhot 60: We are an approved UK Everhot Dealer covering Ceredigion, Pembrokeshire & Carmarthenshire. Ordering an Everhot is easy, just pop in to our Cardigan showroom or call us to place your order on 01239 613891. The cost of the EVERHOT 60 is £5,350.00 inc VAT. The 40th Anniversary Metallic Edition 60 is £6,050.00. Leadtime for delivery can vary, but typically is between 6 to 8 weeks depending on current demand. Delivery within U.K. mainland - Subject to distance from the factory, a minimum cost of £150 or a maximum cost of £360. For deliveries to other EC countries or outside UK mainland, please ring for a quotation.